If you are a collector of white Burgundy, “premox” is a dirty word. The possibility that a prized Corton-Charlemagne or Bâtard-Montrachet might be afflicted with a condition tasters describe as premature oxidation is alarming indeed. There is nothing more disappointing than pulling the cork and finding that something is very wrong with the wine, particularly a rare and expensive bottle. This bizarre disorder seemingly arrived out of the blue in the mid-1990s. Wines which in the past would have enjoyed an extended life in bottle – from ten to twenty years or longer – were showing abnormal symptoms of aging after just a few years. What factors triggered the deep yellow to orange colors and honeyed flavors that evoke oxidation? Were there larger environmental forces at play, or were alterations in cellar techniques, closures or bottles to blame? Since the first specimens of premox were acknowledged, an intense debate has swirled among aficionados, much of it marked by speculation and anecdote. A discussion that might seem arcane apparently interests a sizeable audience: at this writing, there are more than 20,000 Google results for premox. Vintage 1995 in Burgundy is generally cited as the starting point for atypical early oxidation, and by the subsequent year the condition seems to have taken hold across the region. Yet, awareness of this peculiar phenomenon did not set in until the early 2000s. Premier and Grand Cru white Burgundies, in most vintages, should be in an early phase of development after five or six years in bottle – not dark in color and dominated by flavors of honey and beeswax. Individual bottles from numerous producers, including many of collectible stature, were displaying unusual and unattractive characteristics. Such was the concern that, in some instances, wines which were maturing in a normal and predictable way were also deemed to be part of the problem. Clive Coates MW, who has published several superb books about Burgundy, recounted an incident in April 2011 involving producer Dominique Lafon, who was lunching in a local bistro. He happened to overhear a comment from a nearby table of Americans proclaiming the Meursault 2004 they had just ordered to be “prematurely oxidized.” As Coates tells it, Lafon went over to the group and said: “This is my wine. And the wine is getting old…but it is what I would expect it to be after seven years. Obviously you prefer your wines younger and fresher. Please accept a bottle …of my Clos de la Barre 2008 with my compliments.” In matters of taste, mistakes can easily be made. The lesson in this case is that wines which are merely showing signs of routine bottle development have no doubt been falsely diagnosed as victims of premox. At the outset, some speculated that the changing climate in France and Burgundy in particular was altering the chemical composition of the fruit. 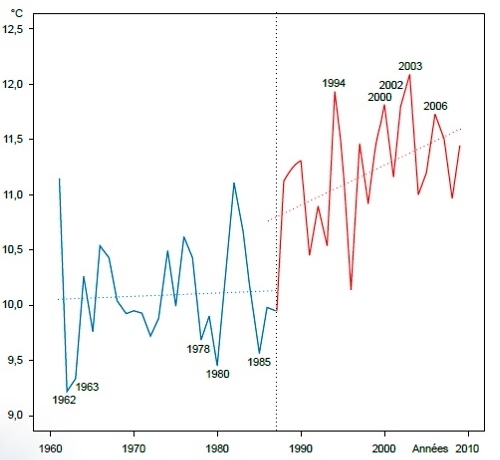 The evidence is irrefutable that average temperatures have been increasing in the past few decades (Fig. 1). Grapes are achieving full ripeness on a far more regular basis than in the past. Viewed as a long-term trend and in aggregate terms, sugars (and alcohol) have been rising while acidities have fallen. The five hottest years on record began with 1994 while the others are in the subsequent decade (2000, 2002, 2003 and 2006) according to researchers at the Université de Bourgogne. The growing season is getting underway earlier, and very hot summer days (above 30° C or 86° F) are more numerous. This general tendency, however, does not directly explain why vintages 1995 and 1996 marked the arrival of premox. Jasper Morris MW, an undisputed authority on Burgundy, has written that 1996, 1999 and 2002 are the three most affected vintages in terms of premature oxidation. Coates, on the other hand, claims that the main culprits are 1996, 1997 and 1998. (Both reached these conclusions in 2013/2014.) When it comes to the perplexing story of premox, even notable experts may have very different perceptions. It is true that changes in climate are gradually reshaping Burgundy’s wines, and that the advent of premox coincides with a period of rising temperatures. But coincidence does not equal correlation or causation. Nevertheless, Roger Bessis, Professor Emeritus of the Université de Bourgogne, has put forward the idea that a changing climate may be implicated and should motivate growers to take countermeasures. There are several winemaking practices which have been flagged in an attempt to explain the onset of the oxidation phenomenon in the mid-1990s. One is the replacement of mechanical presses at many domaines with pneumatic models which yield juice that is clearer. In theory, the gentler pressing was seen to be a step forward; in practice, reducing solid matter also removes a barrier to oxidation. Those who kept older presses such as Coche-Dury did not experience premox. Another contributing cause may be excessive bâtonnage. The aim of lees stirring is to impart greater richness and fat, yet the wine’s evolution may also be accelerated. Last, the 1990s saw a reduction in use of sulfur dioxide in many cellars. Etienne de Montille of Château de Puligny-Montrachet has said that levels were as low as 20 mg/l in some cases, adding that the equipment to measure SO2 (and especially the active portion) was deficient. De Montille now insures that his wines are protected by 40 mg/l of free sulfur to guard against unwanted early aging. Science-based research has in fact gone much further in picking apart the chemical drivers of premature oxidation. Valérie Lavigne and Denis Dubourdieu of the Bordeaux Institute of Vineyard and Wine Sciences published a seminal paper in the early 2000s. They pointed out that this sort of oxidation could affect “all white wines, still and sparkling, dry and sweet, and all grape varieties and origins.” They identified one volatile compound, sotolon, as the “universal marker” for premox in white wines. Sotolon is derived from acetaldehyde and has an aroma reminiscent of curry. The two researchers say, moreover, that there are molecules in honey and beeswax that can be found in the telltale aroma of prematurely oxidized wines. On the flip side of the premox coin, Lavigne and Dubourdieu single out a tripeptide, glutathione, which is present in grapes. Glutathione is a fountain of youth, it might be said, acting as an antidote to premature aging of wine. Healthy, strong vines which do not suffer from severe hydric stress and enjoy sufficient availability of nitrogen yield musts with high glutathione levels. Premox can make its appearance while the wine is maturing in barrel. Keeping wine in contact with the lees – deposits of dead yeast cells – is a preventive measure. The lees have a double benefit: they are effective in staving off oxidation, and they protect glutathione. Conversely, sotolon is found at higher concentrations in wines separated from their lees. Lavigne has also suggested in recent research that carefully judged bâtonnage is actually a safeguard against oxidation, as is restricting the delay before the malo-lactic conversion. Is the threat over? Jasper Morris claims that many of the domaines who were most affected have taken corrective action. Still, he is “not ready to offer a clean bill of health.” It is nonetheless fair to say that the furor over premox seems to have subsided. Is there a similar threat – latent for the time being – which could strike other types of wines, including reds? The phenolic content of many red wines derived from the skins serves as a natural barrier against rapid evolution. This being said, there is a global trend in favor of maximum ripeness and oxygen-rich handling with the aim of engineering richness, suppleness and early appeal. In many regions, climatic forces are also pushing wines in this direction. Denis Dubourdieu predicted that, by the early 2020s, celebrated reds from Piedmont, Bordeaux and the Rhône may face a scandal just as “explosive” as the one suffered by coveted white Burgundy. Anson, J. Premox: has the crisis moved to red wine? www.decanter.com, November 11, 2014. Bessis, R. Climat, vigne, vin : trois cercles de défense. Réflexion sur l’oxydation prématurée des vins blancs: le changement climatique joue-t-il un rôle ? Réchauffement climatique, quels impacts probables sur les vignobles ? Institut Universitaire de la Vigne et du Vin Jules Guyot. [Global warming, which potential impacts on the vineyards?] 28-30 mars 2007 / March 28-30, 2007. Coates, C. Premature Oxidation of White Burgundy (extract). My Favourite Burgundies. www.clive-coates.com, 2013. Dubourdieu, D. et al. Premature ageing of wine aromas. Institute of Masters of Wine. www.mastersofwine.org, 2010. Morris, J. White Burgundy out of the Woods? The World of Fine Wine, November 12, 2015. Richard, Y. & Castel, T. Le Changement Climatique en Bourgogne (1961-2040). Université de Bourgogne, July 2012. Saverot, D. Oxydation des bourgognes blancs. La revue du vin de France, March 2009. Schmitt, P. Premox study shifts to red wine. www.TheDrinksBusiness.com, September 1, 2015.